Competition is defined as an interaction between two or more individuals of the same population or two or more populations in which each negatively affects the other in access to a limited resource(s) (food, water, nesting sites, shelter, mates, etc.). Mutualism is defined as an interaction between populations that is favorable to both. Two main types of competition are identified: intraspecific competition and interspecific competition. 1. Interference (adapted) intraspecific competition. This occurs in species that establish hierarchies through aggressive behavior where one or more individuals within the population hold a dominant status over the others. Through direct interaction these individuals will limit or prevent access of more subordinate individuals to a resource. This type of competition may also occur when individuals within a species establish territories and limit the access of others to a resource. In this type of competition only those individuals who are dominant or hold territories will increase their reproduction success. It is sometimes called 'contest competition' indicating displays and contents between individuals for access to a resource (usually mates). 2. Exploitation (contest) intraspecific competition. This occurs between individuals of the same population exploiting the same resources and reducing or depleting its availability to others. This competition is indirect interactions between individuals such as deleting of a food source. Intraspecific competition is affected not only by the type of competition but also by the type of resource. A territory, which is not depletable, will affect the survivorship of future generations. Competition over consumables, such as food, may result in decreased availability for future generations and such resources may need time to recover. Intraspecific competition is density dependent and may cause density-dependent mortality. 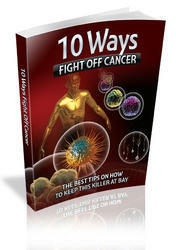 At low densities no intraspecific competition exists and competition for resources does not play a role in survivorship. As densities increase, a threshold is reached where density begins to influence mortality through resource availability. When plotted as a graph in terms of population growth rate, the result is either a J-shaped growth or an S-shaped/sigmoidal curve, both referred to as logistic growth. 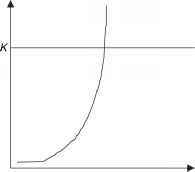 Figure 1 Exponential population growth. Figure 2 Density-dependent population growth. where K is the carrying capacity of the habitat (Figure 2). In this model, environmental factors affect each stage of population increase, and as population density increases so does environmental resistance. Any competition between populations affects the fitness of both. The resources invested (energy, time, and matter) in the competition or avoidance of it, reduces availability of these resources and adversely affects the reproduction success of the populations. When one population fully or partially depletes a limited resource, the availability of such resource is reduced for its competitor. Due to the price each population pays in reduction offitness as a result of competition, it is advantageous for each party to avoid competition which has resulted in natural selection favoring niche separation, specialization, and diversification. Interspecific competition is the competition between individuals of different species. Under this competition type we also recognize two types of competition but the interaction is between individuals of different species and not individuals of the same population as is the case in intraspecific competition. (a) Classical exploitative competition due to resource depression. Two consumers sharing a common prey may compete indirectly by one competitor consuming the resource before the other has access to it thereby depriving its competitor of resource availability. (b) Apparent competition. Two prey species may appear to compete because, if either increases, a shared predator also increases, which operates to the detriment of the other prey population. (c) Competitive mutualism. Two populations are weak competitors but are both strong competitors with a third population. By each of the weak competitors inhibiting the third (strong) competitor, they both benefit. This scenario can also arise in a four-species system (facilitation), where two species each consume one of two competing prey species. In this scenario if one predator species increases, it results in decrease in its prey species which benefits the competing prey species which can now increase. As a result, predator 2 increases since its prey is now more abundant but in time it decreases the prey availability benefiting prey 1 and so on. 2. Interference competition: allelopathy or interspecific territori-ality. This involves direct interaction between species (populations) over a limited resource by reducing access of one population to that resource. This can be accomplished by establishing a territory, obtaining a dominance status within a hierarchical species, or releasing toxins into the ground preventing other plant population from establishing themselves. If the competition is for space, 'preemptive competition' may arise, determined mainly by which species arrived at the resource first. A set of relationships between two species competing for a limited resource have been proposed by Lotka and Volterra and has been used as a basis for analysis in ecological studies. In 1925, Alfred J. Lotka and Vito Voltera described competition in a set of simplified equations. These equations are a modification of the Verhulst-Pearl logistic equation (see Growth Models) and are based on the same assumptions. ai2 represents the inhibitory effect species X2 has on the population growth of species Xi and a2i is the inhibotory effect species Xi has on the population growth of X2 (competition coefficients). The inhibitory effect ofeach population growth affects both the population itself (intraspecific competition) and the competing species population (interspecific competition); where both population growth ri and r2 decreases as Xi increases and vice versa. In other words, each individual in Xi population inhibits Xi by i/Ki and inhibits X2 by a2i/K2. 1. 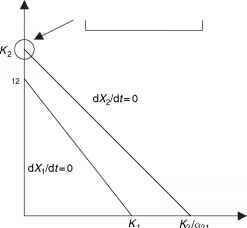 Intrinsic rate growth (r), competition coefficient (a), and carrying capacity (K) are all constants. 2. Every individual within each population is identical. 3. The populations are not allowed to diversify. 4. The environment (habitat) is homogenous. By evaluating the Lotka-Volterra equations, it is predicted that both competing species will coexist and that the competition between individuals of the same species (intraspecific) is weaker than the competition between the two species (interspecific). To understand the different scenarios predicted by the equations we must first define a zero isocline represented by a straight line in population growth graphs. The zero isocline for each species states that at any given point along that line the species does not increase or decrease. 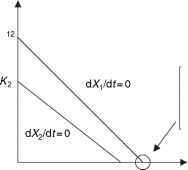 This zero isocline is calculated by setting the growth rate of that species equal to zero (dX/ dt = 0), and solve for X. Any point above the zero isocline indicates that the population of that species is decreasing; any point below the isocline that the population is increasing. Where no interspecific competition exists, ai2 or X2 are equal to zero in eqn  and a2i or Xi are equal to zero in eqn  and both populations will grow sigmoidally as described by Verhulst-Peral logistic equation and both populations will reach their carrying capacity before stabilizing. Figure 3 illustrates two extremes. The top line examines population Xi, where on one extreme population 2 is absent and population Xi is at its carrying capacity, Xi = Ki. In the other extreme, species Xi is absent and population X2 is at its carrying capacity where X2 = Ki/ai2. The bottom line examines population X2. On one extreme X2 is at its carrying capacity (X2 = K2) since population Xi is absent and X2 is zero when population Xi is at its carrying capacity (Xi = K2/a2i). Between the two lines any possible combination of the two species is possible. Same interpretation can be made for the isocline of species X2 (Figure 3). 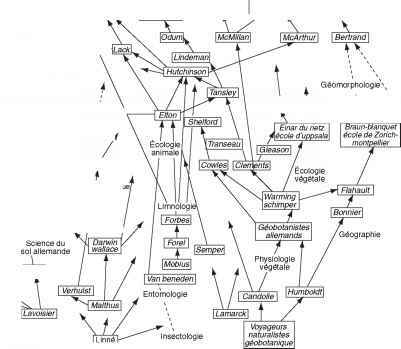 Placing the two lines on the same axis enables us to predict to what extent each competing species affects the other. When the two isoclines do not cross, one of the species will prevent the other species from occupying the same habitat. In Figure 3 species Xi will eventually cause species X2 to decline to zero (Xi isocline is found above X2 isocline and as Xi approaches Ki, X2 approaches zero); Figure 4 shows the opposite situation where as species X2 approaches K2, species Xi approaches zero (X2 isocline is found above Xi isocline). The Lotka-Volterra equations predict that coexistence of the two populations can only take place when the two isoclines cross one another. Four possible scenarios may result from interspecific competition of two species and the outcome depends on how the two isoclines are in relation to one another. Population X, is at carrying capacity (K,). Population X2 is absent. X, - Size of population 1 Figure 3 Interspecific competition, species X- wins. Population X2 is at carrying capacity (K2). Population X1 is absent. X1 - Size of population 1 Figure 4 Interspecific competition, species X2 wins. Population X1 stabilized at carrying capacity (K1). Population X2 was pushed to extinction. Figure 5 Competitive exclusion of population X2 by population X1. and X2 above its isocline (decreasing). 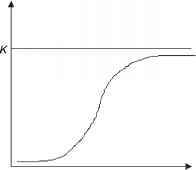 The result of this scenario is population X1 driving X2 into extinction and increasing until X1 = K1. This scenario is termed 'competitive exclusion of population X2 by population X1'. Scenario 2 (Figure 6). This scenario is the exact opposite of scenario 1 where the two isoclines do not cross and the isocline of population X2 is above that of X1. Any point located below X1 isocline represents coexistence of both populations of species and indicates both species increasing. 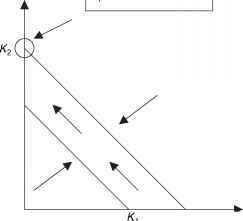 Any point located above X2 isocline represents both species decreasing. Points located between the two isoclines represent X2 below its isocline (increasing) and X1 above its isocline (decreasing). The result of this scenario is population X2 driving X1 into extinction and increasing until X2 = K2. This scenario is termed 'competitive exclusion of population X1 by population X2'. Population X2 stabilized at carrying capacity (K2). Population X1 was pushed to extinction. Figure 6 Competitive exclusion of population X1 by population X2. One of the populations will eventually reach carrying capacity. 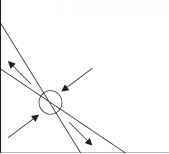 Both populations will coexist only at the point of crossing isoclines. This situation is unstable and may change due to environmental shifts. 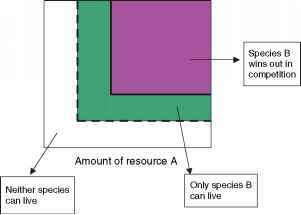 Figure 7 Coexistence of two species when both species experience zero population growth. unstable and will result in one of the species eventfully excluding the other. Under this scenario X1 will exclude X2 when K1 > K2/a21 (carrying capacity of population X1 is higher than that of X2 divided by the competition coefficient) which will result in population 1 reaching its carrying capacity (X1 = K1) and population X2 driven to extinction. In the event that X2 will reach its carrying capacity, since K2 > K1/a12, the result would find species X1 driven to extinction and X2 = K2. If both species are at zero growth (where isoclines cross), any environmental change may shift the species from this point leading one of the population of species to extinction. Both populations will reach a stable equilibrium and coexist regardless of initial population size. 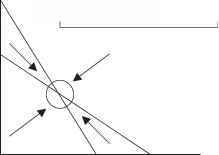 This will occur where both isoclines cross. 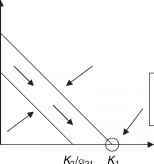 isoclines and decreases below the isoclines, but any point found between the two isoclines represents coexistence of both populations of species leading to a stable situation where the isoclines cross. This situation infers that at the point of isoclines crossing, each individual within the population is affected more by individuals of its own population (intraspecific competition) as opposed to being limited by individuals of another population of species (interspecific competition). When examining the possible scenarios outlined through the Lotka-Volterra equations, it is clear that in scenarios 1 and 2 one species eventually drives the other to extinction. In 1934, a statement by Georgyi Frantsevitch Gause generated an important debate in the ecological community regarding species competition. 'Gause's hypothesis (or Gause's Law)' states that due to competition, two similar species utilizing similar resources will scarcely ever exist within the same niche and each will be forced to utilize separate food sources and modes of life that will create a relative advantage over the competitor. Gause identified scenario 4 of the Lotka-Volterra scenarios as the case of different niches which explain the possibility of stable coexistence of two competitive species. In 1960, Garrett Hardin defined the 'competitive exclusion principle' which stated that ''complete competitors cannot coexist'', and further defined the Lotka-Volterra scenarios and conclusions. 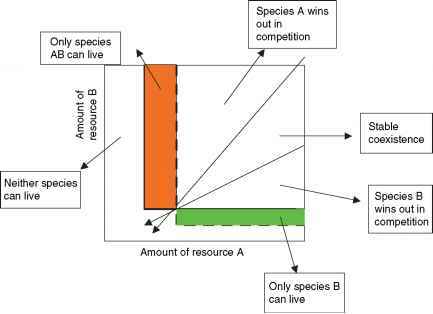 Figure 9 Two species utilize the same resources (resource competition). Each panel represents a scenario where one species consumes both resources faster than the other species causing the other species' extinction. Figure 10 Two species utilize the same resources. Each species consumes one resource faster than the other; this may result in a stable or unstable equilibrium. 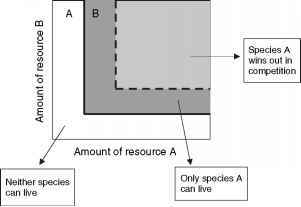 scenario consumption rate is higher for one resource by one species and higher for the other resource by the second species. As a result zero-growth isoclines cross, reaching equilibrium. This scenario may result in a stable or unstable equilibrium that depends on the specifics of the species' consumption rates (Figure 10). Tilman specified that in order to predict the direction the equilibrium will lean, we must know the rate of supply as well as the rate of consumption of each of the resources. See also: Biological Control Models; Competition and Coexistence in Model Populations; Growth Models; Prey-Predator Models; Spatial Distribution Models.